Lee Berglund was a prolific photographer from Larned, Kansas, who documented the Santa Fe on the Great Plains encompassing Kansas, eastern Colorado - as far west as Trinidad and Denver - western Oklahoma, and northwest Texas as far south as Slaton. We see, through Lee's lens, the history of the Santa Fe's last 30 years in this territory at the heart of the Santa Fe. During Lee's active years - 1964 to 1995 - the railroad experienced great changes. In 1964 Santa Fe's famous passenger service was in its final years, the all-purpose boxcar dominated freight trains, First-Generation diesel locomotives - although downgraded to secondary service - could still be seen and second-generation units were new and pulled the highest priority trains. The familiar way car was in regular use. 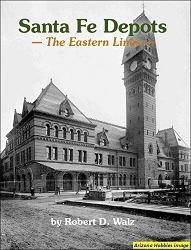 The small town depot was very much in evidence and a dense web of branch lines characterized the Santa Fe on the Great Plains. 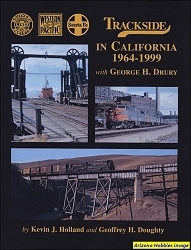 Over the next 30 years, all this would change; successive generations of motive power would invade the area, the way car would fade into history, many branch lines would be abandoned or sold to short line operators, agencies were closed as Santa Fe centralized freight offices and so went the depots. Through Lee's lens, we see all these changes, beginning with Lee's home turf, the Great Bend District, followed by a look at Santa Fe branch line railroading, Great Plains style. And in the final four chapters we focus primarily on Santa Fe's mainlines on the Great Plains. All in all, Lee Berglund, through his photographic efforts in the Great Plains, has contributed much to the canon of the Santa Fe. This Volume is a tribute to Lee and his work. 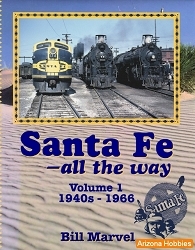 Santa Fe Railway H&MS, softcover, 152 pages, 12 x 8.5 x .5 in., 276 Color photographs, full color map and timetable reproductions. Railroads of Arizona three volume set NEW CONDITION!